The Caribbean spiny lobster (Panulirus argus) can be found from North Carolina and Bermuda south to Brazil—and also in the Aquarium's Blue Hole exhibit, where they share the space with some impressive goliath groupers. While Caribbean spiny lobsters are nocturnal, you can find them scurrying about the dim exhibit or resting in their favorite den. They are about a foot long, though they can grow to be longer than 3 feet and weigh 15 pounds in the wild! 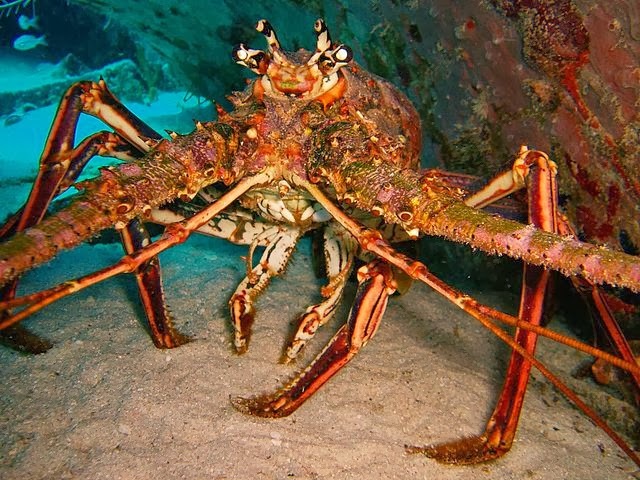 Caribbean spiny lobsters are one of approximately 30 different spiny lobster species found in tropical and sub-tropical waters around the world. They can migrate long distances in single file lines called queues. This species can live down to depths of about 1,650 feet and feed on gastropods, bivalves, and carrion (dead things). 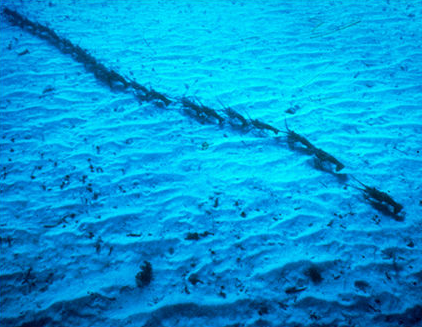 Moray eels, nurse sharks, groupers, turtles and sometimes octopus are among the animals that prey on these animals. Unlike the American lobster they lack large claws and have spines covering their body for protection. Like their American lobster cousins, Caribbean spiny lobsters have long antennae on the front of their carapaces for defense. 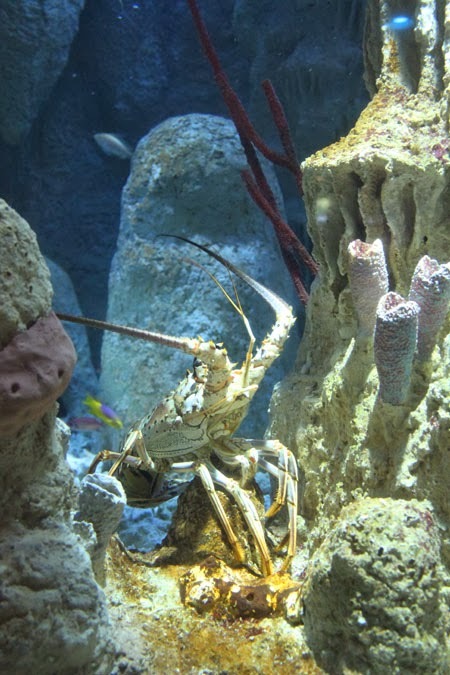 Caribbean spiny lobsters also shed their shells in order to grow bigger like other crustaceans. You can sometimes find an Aquarium educator holding a molt, which was collected after an animal in the Blue Hole exhibit shed its shell. This happens when lobsters split their shell into two pieces and squeeze out, leaving the molt behind. Look out for this biofact because it's a great way to get a feel for those spines that give this lobster its name! 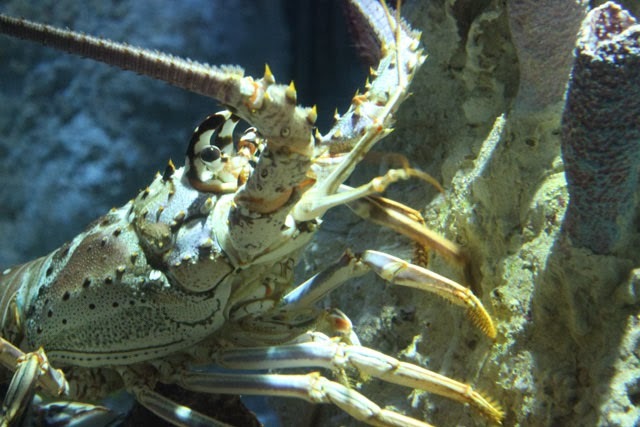 Conservation Notes: Caribbean spiny lobsters are a popular seafood and commercially fished. The fishery is regulated with size, season, egg-bearing and trap limits. The population of the Caribbean spiny lobster is healthy. Look for other lobsters throughout the Aquarium! Can you find relatives of the Caribbean spiny lobster in the Isle of Shoals, Boulder Reef, Lobster Nursery and Edge of the Sea exhibits?